Barbecue Roast Beef Recipes for the Rotisserie or BBQ Spit. Perfect results every time using any of these three barbecue roast beef recipes for the BBQ spit or rotisserie grill. The secret to cooking the best beef is to keep it simple with good quality beef, just rub on a few herbs and spices, keep on basting and let the barbecue do the rest. Get a whole piece of meat as opposed to a rolled joint. Rump or sirloin is always good. Avoid the less tender cuts such as brisket, chuck, stewing steak. Make sure there’s a reasonable amount of fat on the beef because this will help keep it succulent throughout the cooking process. The great beauty of barbecue spit roasted beef is that you can set it off when the fire is hot and this will sear the outside and the inside will gently cook as your fire naturally subsides until beautifully tender. 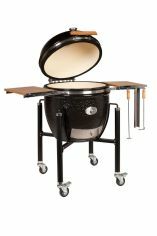 Take care when inserting the rotisserie or spit rod both from a safety perspective and also try to balance the meat. This will make for a good all round cooking and take the strain of the spit motor. Note - The temperatures above represent when to take the meat off the heat and leave it to rest. Resting is an important phase as this allows the muscle to relax and retain moisture and the core temperature of a large hunk of beef like the one we're cooking will typically rise by 9°F (5°C) through the resting phase. Remember also the pressure test. Give it a prod, if it springs back it’s rare, if the indentation stays its well done and if it’s a solid piece of beef properly cooked on the outside, it’s safe to eat. If it’s a rolled joint make sure it’s cooked through because bacteria grow on the surface of beef and that surface is also inside the rolled joint. (It's the same argument as to why you should always cook a hamburger thoroughly. Equipment-wise I like to use a portable barbecue, fire at the side and the all important drip tray. Perfect for catching the drips and basting, but also protecting the fire from excessive fat that may cause flames and your fire to burn quicker. Because of the long cooking time, a rub is much more suitable than a sauce (especially if sugar or honey based which will just char and burn) so all these barbecue roast beef recipes have barbecue rub variations. See my Barbecue Rubs pages for the full range and down below I’ve just put a few of my favorites that complement these barbecue roast beef recipes. The only other thing you need is a spoon to baste the meat. Depending on your set up you can catch the juices that drip from the joint so just spoon them back over the meat at regular intervals and you crank up the flavour! Now I’m not “taking the mick” but why don’t you try salt and pepper? I’m serious. Grind up some sea salt and liberally mill in fresh black pepper, once the beef is on the spit rod just roll is in the mix. Try it, sometime the best things in life are the least complicated. Insert the spit rod to get the best possible balance. Grill for your preferred time and keep basting from the drip tray all the way. For a variation on the theme, check out my Italian Fiorentina for a vinaigrette dressing that will top this simple grilling method. Naughty – save the contents of the drip tray, it’s great on toast. Don’t have this as part of your low fat calorie controlled diet! boneless beef roast of course! - this can be a single cut or a rolled roast. Basically as above but just add garlic! Peel the cloves of garlic and cut into pegs. Use the point of a sharp knife to make incisions into the meat and insert the garlic pegs. Massage in salt and pepper at the same time. Remember if using a rolled joint it’s best to cook towards medium / well done to make sure it’s tender. 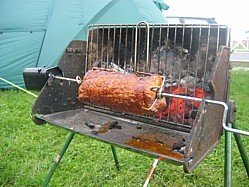 This next of my barbecue roast beef recipes is better in my opinion simply slapped on the barbie and turned regularly over medium hot coals especially if it’s a smaller joint. If you’ve gone the “whole hog” then the rotisserie will do you proud too. I’m sure you’re getting used to this now. Insert the garlic pegs using a sharp knife to make incisions into the meat. Mix the other ingredients together in a bowl and rub away then let the meat rest for 1 hour whilst the rub works its magic. Insert the spit rod and off you go! Don’t forget the value you add to all of these barbecue roast beef recipes - keep on basting!